Unofficially the first NASCAR Sprint Cup race of the season, the 2012 Budweiser Shootout, the world's top stock car racing stars are unleashed on the 2.5-mile Daytona International Speedway a weekend ahead of the prestigious Daytona 500. Open to the drivers who clinched a top-25 finishing position in the overall Sprint Cup Series driver standings last season, past winners of Daytona Cup Series events who are still ineligible through points are also granted entrance into the 34th running of the Budweiser Shootout. Started as a 20-lap sprint event in 1979, the Budweiser Shootout's 2012 edition will consist of 75 laps divided by two segments (a 25-lap and 50-lap part) for the ultimate Saturday night spectacle under the lights of the Daytona oval. Settled by 25 special bottles of Budweiser beer, the starting lineup was drawn by the participating drivers of the non-points race. Unlike the pressures of qualifying for a NASCAR Sprint Cup Series event (a sensation that will certainly affect drivers during Sunday's qualifying for the Daytona 500), the Budweiser Shootout draw was a more leisure occasion where fans were reacquainted with their favourite NASCAR drivers. From the massive cheers for Dale Earnhardt Jr to the more colourful choir of cheers and boos for Kyle Busch, the 2012 Budweiser Shootout field was slowly set with many top starting spots selected early. One of the early drivers, Kyle Busch, drew a front-row 2nd place spot for the Saturday night event. 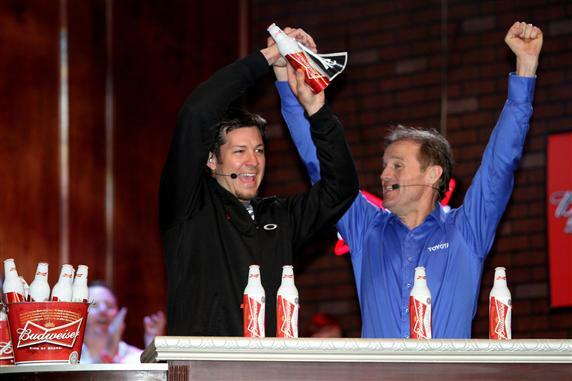 When the draw concluded, Martin Truex Jr left the ceremony with the Budweiser Shootout 2012. A field being led by a pair of Toyota Camrys (Truex Jr's #56 NAPA car for Michael Waltrip Racing and Busch's #18 M&Ms machine owned by Joe Gibbs Racing), the Japanese-derived auto brand has yet to win the Budweiser Shootout. Behind the all-Toyota front row, Brad Keselowski's #2 Miller Lite Dodge will start from the 3rd place position with Jamie McMurray joining on the second row for this Daytona race. With David Ragan starting 5th in the 2012 Budweiser Shootout, the top-5 drivers for this event are all non-winners of the Daytona non-points race. Parting with the Penske Racing team in a highly eventful departure in the off-season, the defending winner of the Budwieser Shootout Kurt Busch drew a 6th place spot. The older Busch will be driving a Chevrolet in Sprint Cup competition for the first time for Phoenix Racing. Kurt Busch's former car, the #22 Penske Racing Dodge, will be driven by AJ Allmendinger in his maiden race for Penske Racing. Other former winners of the Budweiser Shootout will be starting the Saturday night with the additional challenge of a deep race position. Coming off his third championship season in 2011, two-time Shootout winner Tony Stewart will start his #14 Chevrolet from the 15th position. Starting 18th will be the 2005 Budweiser Shootout winner and five-time NASCAR Sprint Cup champion Jimmie Johnson. Johnson's #48 Chevrolet may easily have the support of new Hendrick Motosports teammate Kasey Kahne placed just one spot behind. Budweiser Shootout victor in 2009 and 2010, Kevin Harvick will start his #29 Richard Childress Racing Chevrolet in 22nd spot. The race's title sponsor is also worn on the body panels of Harvick's Chevrolet. Fortunately for Tony Stewart, Jimmie Johnson and Kevin Harvick, the Daytona International Speedway is a renowned restrictor plate track providing the speed for drivers to realistically launch their charge to the front. The 2012 Budweiser Shootout is set to start at 8:10 PM Eastern time and will be televised on Fox in the United States as well as TSN2 in Canada.